Set at the tail-end of World War II, writer-director David Ayer's follow-up to Sabotage stars Brad Pitt, Shia LaBeouf, Logan Lerman, Michael Peña and Jon Bernthal as a Sherman tank troop on a dangerous mission behind enemy lines. Jim Parrack and Scott Eastwood co-star. Read our review here. 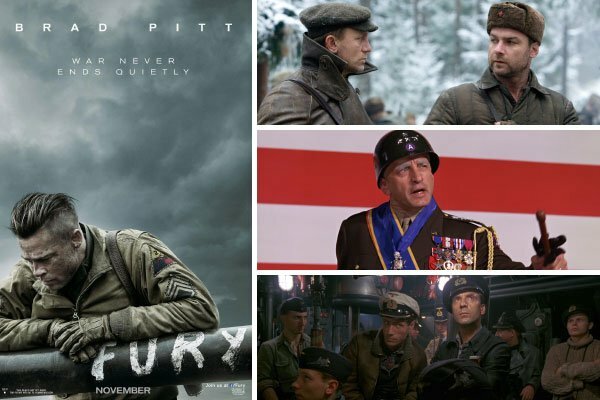 For more harrowing tales of war and bravery, check out this trio of World War II dramas that sprawl from the wilds of Russia to the fronts of Africa and Europe, as well as the depths of the Atlantic Ocean. Defiance (2008) Daniel Craig fronts this Academy Award-nominated drama as a Jewish man who escaped the Nazis by fleeing into the Belarussian forests. There, he joined with Russian resistance fighters, becoming part of a force that would save 1,000 Jewish non-combatants. Liev Schreiber and Jamie Bell co-star; Edward Zwick directs. Patton (1970) George C. Scott fronts this bold biopic that captured the World War II era of General George S. Patton Jr.'s distinguished military career. The film won Scott his only Oscar, while picking up six others including Best Adapted Screenplay, Best Director, and Best Picture. Karl Malden, Stephen Young and Michael Strong co-star; Franklin J. Schaffner directs. Das Boot: Director's Cut (1981) This German-made drama recounts the claustrophobic war story set in the belly of a submarine. Following one German U-boat engaged in the Battle of the Atlantic, this film earned six Academy Award nominations, and became a must-see for history buffs. Jürgen Prochnow, Herbert Grönemeyer, and Klaus Wennemann co-star; Wolfgang Petersen directs. Michael Keaton headlines as a washed-up movie star desperately trying to reclaim the spotlight with a daring Broadway production. But as problems backstage mount, he's haunted by the alter-ego of his greatest role. Zach Galifianakis, Edward Norton, Andrea Riseborough and Emma Stone co-star; Alejandro González Iñárritu directs. Read our review here. Can't get enough of showbiz comedies? We're with you. So here's a few that are packed with crooked producers, deluded voice actors, and out of this world fans. The Producers (1968) It should be considered a cinematic sin to have not seen this delightfully insane comedy from Mel Brooks. Zero Mostel stars as a grifting Broadway producer who loops a neurotic accountant (Gene Wilder) into his plan to purposely tank his next production in a bizarre get-rich-quick scheme. Kenneth Mars, Lee Meredith, and Christopher Hewett co-star; Mel Brooks directs. In a World... (2013) "Let's give the voiceover industry something to talk about!" Ever wonder why the narrators of trailers are usually men? Writer/director/actress Lake Bell takes on this odd boys club in her R-rated comedy, playing the daughter of a voice over legend, who desperately wants to get out of his shadow. Demetri Martin, Rob Corddry, Michaela Watkins, Ken Marino, Tig Notaro, and Nick Offerman co-star; Bell directs. Galaxy Quest (1999) A washed-up TV actor, a frustrated thespian, a past-her-prime sexpot, and an overgrown child actor make up the alumni of the titular sci-fi series that has long been canceled, but still holds great influence. When they are picked up by aliens who believe the series was a documentary, this infighting ensemble must pull together to save the day! 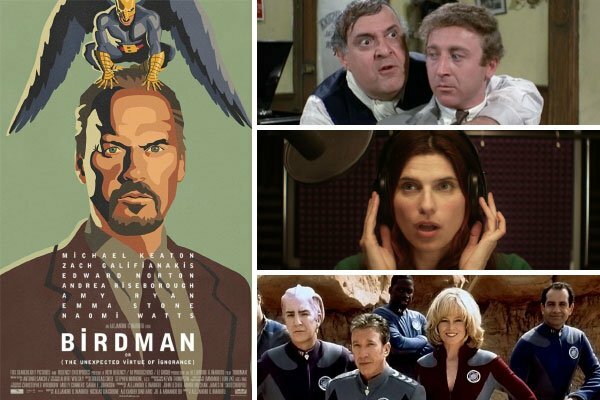 Tim Allen, Alan Rickman, Sigourney Weaver, Daryl Mitchell and Sam Rockwell star; Dean Parisot directs. 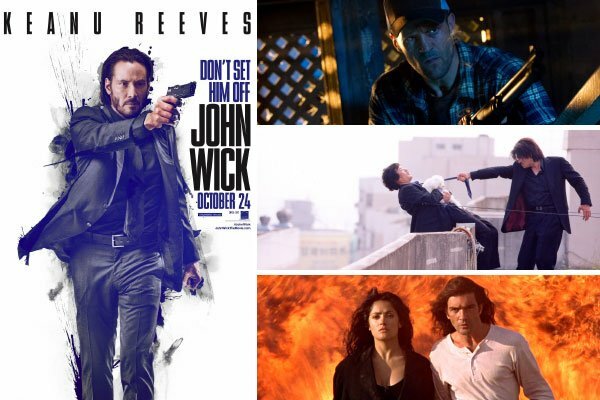 Keanu Reeves fronts this ultra-violent revenge thriller out of Fantastic Fest as a former hitman who comes out of retirement to wreak vengeance on those who've wronged him. Michael Nyqvist, Alfie Allen, and Willem Dafoe co-star; David Leitch and Chad Stahelski direct. Read our review here. For more thrillers fueled by vengeance, check out this selection that boasts meth-making hillbillies, psychotic classmates, and a dashing desperado. Homefront (2013) Sylvester Stallone penned the adapted screenplay for this thrilled based on a Chuck Logan novel. Jason Statham stars as a former DEA agent/loving dad who will do anything to protect his daughter. But when he incurs the wrath of a local drug ring, he may have to prove it. James Franco, Winona Ryder and Kate Bosworth co-star; Gary Fleder directs. Oldboy (2003) In the revenge thriller to which all others are compared, Min-sik Choi stars as a man who is abducted, imprisoned and tortured for 15 years with no idea why. But when he's abruptly released, he's left to discover the mystery of this brutal vengeance. Ji-tae Yu, Hye-jeong Kang, and Dae-han Ji co-star; Chan-wook Park directs. Or if you prefer, give the Spike Lee remake a spin. Desperado (1995) The sequel to El Mariachi has its dangerous gunslinger (Antonio Banderas) looking to burn down the devious drug dealer who murdered his girlfriend. Expect explosions. Salma Hayek, Cheech Marin, and Steve Buscemi co-star; Robert Rodriguez directs.